The Valero Energy Corporation is facing a deadline in the coming days to respond to questions from the U.S. Environmental Protection Agency about power issues at its Benicia oil refinery several months after an outage shut down the entire facility for weeks, leading to a major release of pollution. The EPA wants detailed information about the outages that have led to flaring events at the refinery over the last three years, and it wants inspection records for all of the facility’s process units. “EPA believes that much of the requested information is, or should be, readily available at the facility,” wrote Enrique Manzanilla, director of the agency’s Pacific Southwest Superfund Division, in a letter obtained by KQED. The agency has asked Valero to explain its policies on handling outages, its risk management program and its flare system. “The company may not withhold any information from EPA on the grounds that it is confidential business information,” the July 27 letter states. The EPA says Valero is required to respond to the agency within 30 days of receiving the letter. The outage initially sent a huge plume of smoke into the air, prompting evacuation and shelter-in-place orders. It would later lead to several local and state investigations, a multimillion-dollar lawsuit, a decrease in profits for Valero and a push for more refinery oversight by the city of Benicia. A Valero official says the company is working on providing answers to federal officials. “We did receive the EPA request, and we intend to respond accordingly,” Lillian Riojas, a Valero spokesman, said in an email. The EPA’s demands seem to go against the image the Trump administration has established as less interested in strong regulations on the fossil fuel industry. Daniel Kammen, a professor in the Energy and Resources Group at UC Berkeley who has long advocated for strong solutions to climate change, says the EPA’s demand for information from one of the nation’s largest oil companies in connection with a local emergency should be the kind of on-the-ground work the agency does, no matter who’s in the White House. “Actual workers at the EPA have to continue their jobs irrespective of political interference,” Kammen said. If the EPA did not act on its federal mandate to react to Valero’s pollution release, it could be sued by environmental groups, according to Anthony Wexler, director of the Air Quality Research Center at UC Davis. “Despite (EPA Administrator Scott) Pruitt’s stance on climate and environment in general, in numerous decisions he has shied away from taking actions that will certainly lose in court,” Wexler said. The agency’s demands are part of a review of the refinery prompted by the May 5 outage, according to EPA officials who declined to comment further on the agency’s letter to Valero. They came a month after Valero filed a lawsuit against PG&E, blaming the utility for the power failure. The oil giant is seeking in excess of $75 million for damage to refinery equipment and lost revenue it says was the result of the shutdown that took place after PG&E “shut off all electricity” to the Benicia facility. PG&E has said the power failure was triggered by an “inadvertent operation” to protect electrical circuits. It has hired an engineering firm to review the cause. That company, Exponent, has yet to turn over a report to PG&E, according to utility spokeswoman Deanna Contreras. The refinery released more than 80,000 pounds of sulfur dioxide from flaring in the days and weeks after the outage. In June, KQED revealed that the refinery released more than 74,000 pounds of the toxic gas during 14 days of flaring after the outage, described as a “huge amount” by experts. That information came from a report the company filed with state officials and was obtained through a California Public Records Act Request. Valero filed a separate report with the California Office of Emergency Services last month that showed the refinery released more than 8,200 pounds of sulfur dioxide on June 18 and 19. The outage prompted several investigations, including one that revealed damage to part of the facility. California’s Division of Occupational Safety and Health (Cal/OSHA) inspected the refinery after the power failure, closed its investigation the same month and decided not to issue any violations afterward. But the outage did damage one of the refinery’s flares, according to Cal/OSHA. “Attention was given to the South Flare, due to damage on flare tips and the dump stack,” wrote Cal/OSHA safety engineer Sean Sasser in a notice after the inspection. The Bay Area Air Quality Management District issued several notices of violation against the company due to the flaring in the days after the shutdown. Its investigation is ongoing, according to district spokesman Ralph Borrmann. Solano County’s Department of Resource Management also launched a probe. That review is ongoing and is expected to be completed in October, according to Terry Schmidtbauer, the department’s director. Experts say the outage led to an increase in the state’s gasoline prices. And the shutdown hurt Valero’s bottom line. Its lawsuit claimed that the company lost a “substantial amount of profits.” The company’s second-quarter earnings, released last month, fell by more than 30 percent, apparently because it took several weeks to get the refinery back online. The outage has also prompted Benicia city leaders to consider increasing their oversight of the refinery and improve how they communicate with residents about emergencies. On the day of the shutdown, authorities imposed shelter-in-place evacuation orders for parts of the city, and at least a dozen people sought medical treatment for breathing difficulties. 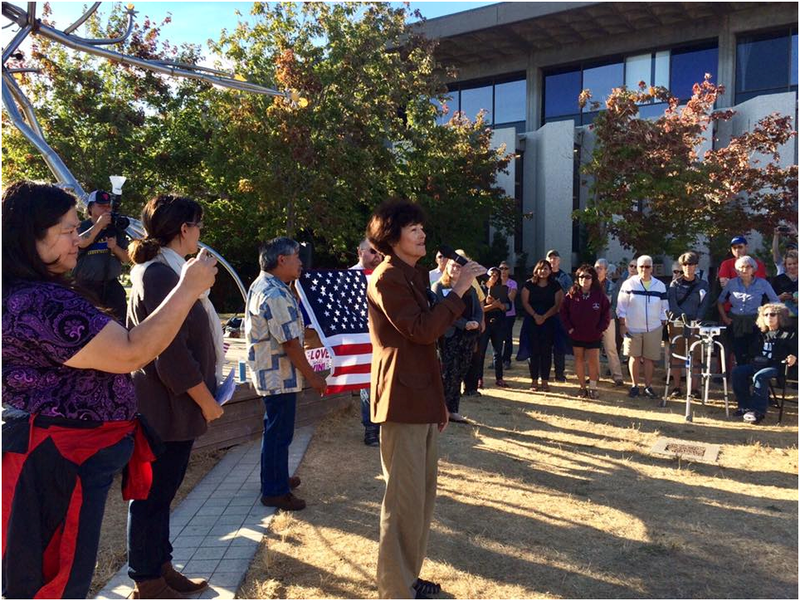 A Unity Vigil drew 150 citizens from Vallejo and Benicia on Sunday evening, August 13. The crowd expressed solidarity and heartfelt outrage following the violent white supremacist, anti-Semitic and anti-gay rally in Charlottesville, VA last week. Of particular note was the presence of the Mayors of both cities. Mayor Elizabeth Patterson represented Benicia, and Mayor Bob Sampayan represented Vallejo. The Benicia Independent stands firm in opposition to the moral depravity of white nationalism, the KKK and neo Nazi ideologies. With the classic “We Shall Overcome” as their rallying cry, Vallejoans took to Unity Plaza Sunday night to take on the hate they had seen on their TV screens over the weekend. About 150 residents sang the legendary civil rights anthem, denouncing the bigotry ­— and violence ­— that led to tragedy Saturday in Charlottesville, Va. The gathering was in response to the death of Heather Heyer, who was intentionally hit by a car Saturday while she protested a white supremacist rally. Sampayan lauded the ethnic diversity of Sunday’s vigil participants. “That’s what really makes me proud,” he added. Patterson said she has no idea how to stop the type of hate shown in Charlottesville during Saturday’s white nationalist rally which caused bloody clashes with counter protesters. Vallejo activist and Neighborhood Rising founder Hakeem Brown expressed determination that the events in Charlottesville would not come to Vallejo. “It’s our responsibility to make sure hate doesn’t take root in Vallejo,” he said to applause. Brown said a divided America allowed for the election of President Donald Trump. “Our division aided his rise,” Brown said. He urged residents to stand together and vote to overcome the hate he says Trump and his supporters are spreading. Several in attendance carried signs, calling for unity and/or for love. Those who addressed the audience stood in front of a large American flag. At exactly 7 p.m., a moment of silence for 32 seconds temporarily stopped the speeches, as those assembled remembered the 32-year-old Heyer. Genea Brice, the city’s inaugural poet laureate, was incredulous as she spoke about Heyer’s death. Brice then read a poem she wrote about unity.